A fire in a metro tunnel near the Kremlin, on the day Sergei Sobyanin stood down to fight an election in September, shows that metro and road construction issues could test the mayor’s popularity. Traffic on a busy stretch of a metro line in central Moscow was halted twice for a total of five hours on Wednesday as underground power cable ignited in the tunnel in two separate locations in the morning and in the afternoon. The incidents left dozens of people seeking medical attention over carbon monoxide inhalation, caused massive transport disruption and made thousands of commuters walk to work. The transport chaos came on the day that Mayor Sergei Sobyanin officially submitted his resignation to President Vladimir Putin, who supported his candidacy in a September mayoral election – the first in the city for 10 years. One of Sobyanin’s possible opponents in the election, Yabloko party leader Sergei Mitrokhin, pointed out that the mayor had praised safety on the metro just three weeks ago, singling out Okhotny Ryad as a model. Sobyanin has undertaken sweeping reforms since taking over as mayor in 2010, and his administration plans $55 billion of investment in roads, metro lines and infrastructure to boost use of public transportation by 45 percent and ease the city’s horrific traffic jams. In addition to Moscow’s current 188 metro stations, the city government plans the opening of 14 new stations by the end of this year. Last year City Hall announced a plan to sell shares in the metro to attract capital for development through 2025. The Moscow metro, the busiest in the world with up to 9 million people journeys per day, has seen similar smaller incidents twice this year. Some 300 people were evacuated from a metro station in the latest incident, on May 5, when the third rail, which powers metro trains, combusted in a tunnel in southeastern Moscow. A total of seven metro system failures were reported last year. Repairs in any of the central stations usually cause inconvenience for commuters, overload nearby stations, and take a while to complete. For instance, it took 14 months to replace 60-year-old escalators and turnstiles and to refurbish the vestibule at Park Kultury station recently. Emergency response is yet to be revised as well. On the morning of June 5, hundreds of passengers were trapped for up to an hour in unconditioned trains in the tunnel during rush hour before they were evacuated. No explanation about the cause of congestion was provided to the passengers through the loudspeaker systems, leading some of them to presume that the metro was attacked by terrorists. “I opened the RIA Novosti website and read out loud the news about fire at Okhotny Ryad. A spry lady shouted ‘A fire on the metro!’ and her neighbor peeped ‘A terrorist attack!,’” Natalya Bem, who got stuck on a train near the Park Kultury station [three stops from Okhotny Ryad station, near which power cable combusted] wrote on her Facebook page. Up to 5,000 people were reported to have been evacuated from eight stations by Wednesday afternoon. After making it outside, people had to figure out on their own how to get to work or to school. 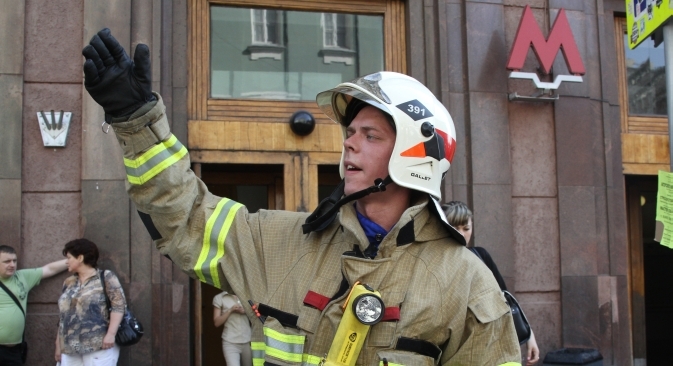 Galochkin called for upgrading the fire-safety system on the metro and improving the emergency alert system to provide passengers with relevant information, such as alternative public transport routes. He also stressed the need to ensure that mobile operators send out notifications to their clients in case of emergency. On Wednesday morning some passengers reported receiving such notifications, while others said they didn’t. The Moscow City Prosecutor’s Office announced it would investigate the June 5 incidents. A similar probe into the May 5 incident found violations of safety rules and resulted in a warning for the deputy head of a department at Moskovsky Metropoliten, the operator of the Moscow metro. At 5 p.m. Wednesday Moscow’s Department of Transport reported that a train stopped in a tunnel between Petrovsko-Razumovskaya and Timiryazevskaya stations in northern Moscow. The incident was caused by “technical reasons,” the department’s press service reported. It took 25 minutes to resume traffic. Anna Nikolayeva, former deputy editor-in-chief of Moskovskiye Novosti, noted in a blog on Ekho Moskvy’s website that residents’ unhappiness with other transport problems such as roads construction, particularly an ambitious project to upgrade Leninsky Prospekt, was also likely to provoke opposition to the mayor. "In fact, the environmental well-being of the city and the constitutional rights of citizens to a healthy environment are being sacrificed for the sake of the work of the construction lobby,” Nikolayeva wrote.